Corporate Risk Solutions, Inc. (CRSI) recently held another successful Peer Sharing Event and notes the action by FERC deferring NERC CIP V5 Standards of Medium and High Impact to July 1, 2016. 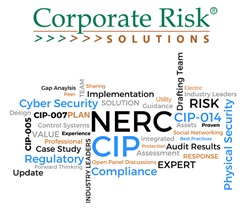 Corporate Risk Solutions, Inc. (CRSI), is celebrating another successful NERC Critical Infrastructure Protection (CIP) Peer Sharing Event held this year in Anaheim, CA from February 29th – March 2nd, 2016. The event brought together representatives from 17 energy companies to discuss the development and implementation of Regulatory Compliance Programs and risks facing the people and entities charged with protecting the ongoing reliability, physical and cyber security of US Bulk Electric System (BES). Speakers from electric utilities included Scott Saunders of the ‘V5’ (FERC Orders 791/822) Standards Drafting Team, John Breckenridge of the CIP-014 (FERC Order 802) Standards Drafting Team, John Pespisa, Director of NERC Compliance for Southern California Edison, as well as Principal and Program Managers, Neil Shockey, Marcus Lotto and Randall White of Southern California Edison. Speakers from CRSI included, Robert Hoopes, Director of Consulting Services, Boyd Nation, Senior Technical Advisor and Harford Field III, Manager of Consulting Services. Topics included NERC CIP V5 – Lessons learned from “Going Live Early,” Audit Results, Critical Infrastructure Protection Supply Chain Risk Management Issues, CIP-014 R1 and R2 Test Methodologies, CIP-014 Overview of Applicability, Risk Assessment and Security Plans, Design and Implementation of Integrated Controls to Meet Compliance with CIP-005 and CIP-007 and Physical and Cyber Solutions for NERC Compliance (CIP-006 vs CIP-014). The primary goal of NERC CIP Peer Sharing Event is to bring together NERC CIP experts and utility members in an open dialogue in one place to discuss current and future issues facing the electric utility industry. This event brought together a dynamic group of speakers and the engagement from attendees made for a very productive and enjoyable time. On February 25th, 2016, the Federal Energy Regulatory Commission (FERC) granted the Trade Association’s motion to defer implementation of the CIP version 5 Reliability Standards for entities with High and Medium Impact BES Cyber Systems from April 1, 2016 to July 1, 2016. View the FERC Order here. The additional three months grants registered entities a little more time to complete CIP V5 training and awareness programs. If your organization hasn’t put together an effective CIP Compliance training program, or needs help with documentation and evidence, feel free to contact Corporate Risk Solutions, Inc. to help you with your Compliance program. If your company doesn’t work in the US Utility industry but you need help with your physical or cyber security please check us out by going to our website http://www.corprisk.net, calling us at 866-492-7072, or emailing info(at)corprisk(dot)net. CRSI is a professional knowledge firm for energy companies who need technical expertise and strategic leadership to deal with compliance, security, and reliability issues in a comprehensive manner. CSRI also provides both physical and cyber security for medium and larger private, public non-profit organizations. CRSI has completed projects for more than 230 energy companies in all 8 NERC regions. CRSI specializes in Physical Security, Cyber Security, and NERC 693 Operational Standards. CRSI is highly experienced in providing Mock Audits, Gap Analysis, Cyber Vulnerability Assessments, V5 Implementation Programs and CIP-014 Physical Security Programs. Corporate Risk Solutions, Inc. is located at 11900 W. 87th Street Parkway, Lenexa, KS 66215. Website: http://www.corprisk.net | Phone number: 866-492-7072 | Email: info(at)corprisk(dot)net.